Manager Steve Lomas was delighted with St Johnstone's win at Dundee but his joy was tempered by the late injury to striker Steven MacLean. "It takes a bit of the gloss off the result, it looks a nasty one - a dislocated elbow," he said. "It was a great team performance but I thought Steve MacLean and Gregory Tade were absolutely outstanding up front. "We hope maybe that it slips back in and we don't lose him for too long." MacLean was on target in the 3-1 victory at Dens Park, adding to his midweek double in the League Cup. The 30-year-old former Sheffield Wednesday and Cardiff forward linked well with Tade, albeit against a very shaky home defence. "He certainly showed why he's played at Championship level," added Lomas. "He held it up and led the line well as well as his great finish." St Johnstone dominated after the interval, having ended the first half 2-1 up, and passed up several good chances to increase their advantage. "I thought we were very clinical and, with a bit of luck, we could have had a few more goals to make it more convincing," Lomas continued. "But it was a thoroughly professional performance." Three consecutive league wins have lifted the Perth side up to fourth place in the Scottish Premier League after a sticky start to the season. "We had a tough run with Motherwell, Hearts and Hibs away and home games with Celtic, Dundee United and Aberdeen," explained Lomas. "Arguably, they should be the top six clubs with their history and resources. "I never doubted that we'd turn it around. With the exception of the Aberdeen game, when we were poor, we should have five or six more points from those opening six games." Nigel Hasselbaink caught the eye for Saints after coming on as a first-half replacement for the injured Paddy Cregg. And Lomas was pleased with the substitute's contribution. "He was fantastic when he came on," enthused the Saints boss. "It was a tough call to leave him out. But Nigel does have this impact when he comes off the bench, when the game opens up. "Nigel has everything in his locker to play at a higher level but we are trying to stress to him that without the ball you need to work and we can't afford to carry any passengers." 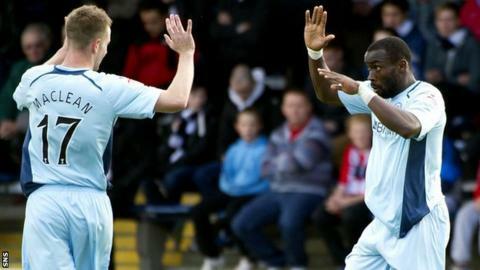 Tade scored the opener and could have had a hat-trick, something that has eluded the powerful striker during his time in Scotland with Raith Rovers, Inverness and now St Johnstone. "I'm still looking," said the Frenchman. "I've had a few doubles. "If you keep searching, eventually you will find it. "But I'm just happy to be on the scoresheet for a winning side." Dundee manager Barry Smith admitted his side had been "beaten by a better team". "We've been guilty of giving away goals this season which haven't helped our cause," he said. "We made mistakes in previous games which cost us but it was different here. "We were hoping to take a lift from the penalty equaliser but before we knew it we were behind again and couldn't claw it back."